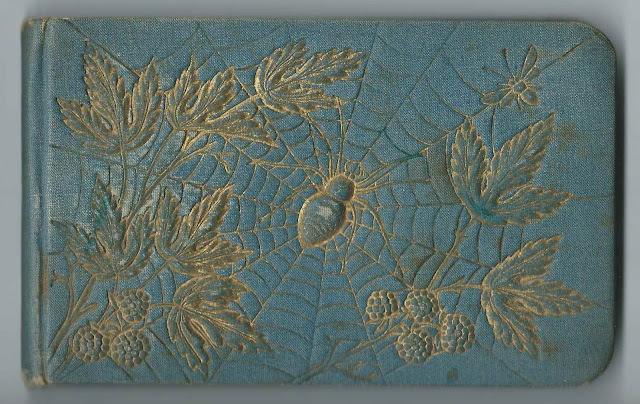 Autograph album that was started in 1882 by Herbert Annas Hathaway of Chicago, Illinois, and Elgin, Illinois. Of extra help to family historians, Herbert left notes about marriages and deaths of many of the inscribers, including his own marriage to Bertha Droussent and her date and cause of death. The album measures approximately 5-1/2" by 3-1/2" and contains the sentiments of over 50 of Herbert's relatives, friends and schoolmates. An alphabetical list of the inscribers, together with any personal information they offered, appears at the end of this post. According to his Illinois Death Record, Herbert Annas Hathaway was born March 1, 1869 at Chicago, Illinois, the son of New York natives Annas Trafton Hathaway and Sylvira Maria (Bartlett) Hathaway. Herbert's parents inscribed faces pages in his album, his father in 1882 at 236 Oak Street, Chicago, Illinois, and his mother in 1885 at Elgin, Illinois. Notice the notes that Herbert left with his parents' dates of death. Herbert's maternal grandmother, Naomi Hillard (Babcock) Bartlett, inscribed two pages, on both of which Herbert added notes with her date of death. Herbert's cousin Mary Little of Sycamore, Illinois; Herbert added a note: "Mrs. Mary Nelgeley", which was a misspelling of the surname of John Fremont Charles Negley. On March 9, 1898 at Hancock, Illinois, Herbert Annas Hathaway married Bertha Droussent, who had inscribed a page in the album at Hamilton, Illinois, on January 26, 1886. Herbert added a note with their marriage date and the date, place and cause of Bertha's death: April 25, 1940 at Elgin, Illinois, of heart trouble. Herbert died in 1942; he and Bertha are buried in the Little Woods Cemetery in Kane County, Illinois. Grandmother B. Herbert's later note: "Died May 10 - 1891" Herbert's maternal grandmother, Naomi Hillard (Babcock) Bartlett, wife of Edward F. Bartlett. She inscribed another page near the end of the album, on March 22, no year written, at Elgin, Illinois. Minnie Becht of Peru, Illinois, in LaSalle Co; inscribed on November 13, 1883. Herbert's later note: "Married to Mr. Austin Baird June 4 1902"
Mr. Charles W. Belcke of 1217 4th St, Peoria, Illinois; inscribed on December 13, 1885. Herbert's later note: "Married to Miss Minnie Neeb March 2, 1898". I found a Charles W. Belcke who married a Mamie (?). Mabel Conner of Chicago, Illinois; inscribed on December 14, 1886. "Good bye 'Rabbit'". Herbert's later note: "Married to Mr. F. Cope 1901...died in California". Frank B. Cope. Maggie Coyne of Alton, Illinois; inscribed on November 13, 1883. Herbert's later note: "married to Mr. A. Rodenberger Nov 27 - 1902... died Jacksonville, Illinois"
Bertha Droussent of Hamilton, Illinois; inscribed on January 26, 1886. Herbert's later note: "married to H. A. Hathaway March 9 - 1898...died of heart trouble in Elgin, Ill April 25, 1940". Wife of album owner Herbert Annas Hathaway. Mary Ernest of Peoria, Illinois; inscribed on February 1, 1885. Herbert's later note: "Mrs. Thomas McAley"
Sarah Faunce of Decatur, Illinois; inscribed on October 1, 1884. Herbert's later note: "Mrs. Antonio Ranch [or Rauch]...died April 11, 1907 aged 39 -"
Sadie L. Frye of Morris, Illinois, in Grundy County; inscribed on April 11, 1884. Herbert's later note: "Married to Charles P. Johnson of Elgin, Illinois - May 1 - 1901... (died) Dec 3 - 1936"
Eliza Gabler; inscribed on May 3, 1886. "My birthday is Nov 26, 1870". D. Webster George; inscribed on January 5, 1884 at "Twin Cottage". Inscribed to "Dear Bertie"; he called himself "Your Loving Brother". Herbert's later note: "died Jan 5 - 1930" Dudley Webster George was the husband of Herbert's sister Carrie Adell (Hathaway) George. Mrs. D. Webster George; inscribed at Jacksonville, Illinois, on April 15, 1883; "Your affectionate sister". Carrie Adell (Hathway) George; wife of Dudley Webster George. Cornelia Goodchild of Waldron, Illinois; inscribed on December 21, 1884. Herbert's later note: "Married"
L. A. Haley; inscribed on January 7, 1884. Herbert's later note: "Mrs. Dexter Garrett...died March 1901"
Annas Hathaway, "your affct father"; inscribed at 236 Oak Street, Chicago, Illinois, on July 2, 1882. Herbert's later note: "Died, August 19 - 1898"
H. A. Hathway, February 14, 1882; album owner. He was Herbert Annas Hathaway of Elgin and Chicago, Illinois. Sylvira Maria (Bartlett) Hathaway, "Mother"; inscribed at Elgin, Illinois, on July 9, 1885. Herbert's later note: "died May 26, 1919. Anna B. Little of Sycamore, Illinois. Herbert's added note: "cousin"
Mary Little of Sycamore, Illinois; Herbert's cousin. Herbert's later note: "Mrs. Mary Nelgely". Mary Abigail Little, married to John Charles Fremont Negley". Eva Lloyd of Formosa, Illinois; inscribed on January 26, 1886. Herbert's later note: "Married to F. Schilling Springfield Mo Nov 23 - 1904"
F. P. Lupien; inscribed on December 16, 1885. Herbert's later note: "Married to Mrs. Mathes". I found a Felix Phelius Lupien who married Elmira Mather. Cecilia Mahon of Alton, Illinois; inscribed on December 21, 1884. Herbert's later note: "Mrs. Jacoby". Vinnie McWilliams of Monticello, Illinois; inscribed on December 21, 1884; Herbert's classmate. Herbert's later note: "Mar John W. Mills, Los Angeles, Cal." George Merrill of Cabery, Illinois, in Ford County; inscribed on February 25, 1883. Herbert's later note: "Married & Divorced...died"
Warren S. Mumma of Granville, Illinois; inscribed on May 12, 1885. Herbert's later note: "Died, Jan - 1888"
Alma Musgrave of Hutsonville, Illinois; inscribed on November 13, 1883. Herbert's later note: "Mrs... Married"
Miss Katie Paris of Arcadie, Illinois; inscribed on March 30, 1885. Herbert's later note: "Mrs. Thomas Cranwill"
Matthew E. Rice of Clay City, Illinois; inscribed on November 6, 1885. Herbert's later note: "Married to Miss"
Frank E. Sahlberg; inscribed on February 28, 1882. Herbert's later note: "Chicago, Died, Dec 4 1895"
Harry Salisbury; inscribed at Elgin, Illinois, on August 9, 1886. Herbert's later note: "Married"
Mary Schack of Columbia, Illinois, in Monroe County; inscribed on March 11, 1886. Herbert's later note: "Mrs. B [can't decipher the rest of the surname]"
E. W. Schroeder of 1202 State Street, Illinois; inscribed on July 2, 1882. No town or city mentioned. Ernest Schroeder of Chicago, Illinois; inscribed on Saturday, July 31, 1886. Herbert's later note: "married to Miss L. Hanson April 7, 1897". A marriage record shows that Ernest Schroeder married Louise Hanson on April 8, 1897 at Chicago, Illinois. Frank Spillard; inscribed at Elgin, Illinois, on June 29, 1885. Herbert's later note: "died June 14 - 1936"
W. W. Spillard; inscribed at Elgin, Illinois, on June 29, 1885. Herbert's later note: "aged 41...Died at Elgin, Ills April 1900". Walter W. Spillard. Herbert Stearns of Chicago, Illinois; inscribed on October 19, 1884. Herbert's later note: "died Nov."
Luella Stephens of Weston, Illinois; inscribed on December 14, 1886. Herbert's later note: "Mrs. Davis"
Fairy Trapp of Kankakee, Illinois. Herbert's later note: "Mrs. Germann [?] (divorced)...Mrs. Haas... Mrs. Clifford died Oct 7 1937"
Lida Wilson of Jacksonville, Illinois; inscribed on April 10, 1884. Herbert's later note: "Mrs. Leonard Laingor"
Walter Wiltsie; inscribed at Elgin, Illinois, on July 24, 1883.